Photo provided by Alfons en Riki Verstraeten . The Historic City of Yazd is a traditional earthen city where life has been adapted to its desert location, most notable via the water system of the qanats. Yazd is a city with a long history dating back to the Achaemenid era, and was located along the Silk and Spice Roads. It prospered from trade. I visited in December 2017 from Shiraz, taking the local bus at 2pm and arrived around 9pm. I stayed at a local caravanserai not far from the Jame Mosque. So the first thing to do in the morning after the warm chai was to visit the Jame Mosque. It's situated in the city center with two tall Shia minarets, the tallest in Iran at 45 meters. Other than that the mosque itself was not that impressive, probable due to the worn out pale colour of the mosaic and ceilings. My main interest in that building was to look for the Zarch Payab (The Persian Qanat WHS) that took me a while to locate it. The was a signpost next to the staircase leading all the way down to the bottom with dimming light. But I was a bit disappointed when I reached the bottom where the big well was situated, as the water was not flowing and it looked it hadn't been used for a long time. It happened the same to the other qanats I went in the city. Maybe they have a modern way to extract the water now. Luckily I saw water flowing at the Kushkno Watermill (Qanat WHS). Other than qanat, the city is full with tall wind towers. I was there during winter but I can imagine that it must be very hot during summer time. So the locals built tall wind towers to catch the wind, whichever direction it came from. You can see the view of the city by walking up to the upper floor of any coffee house. I also walked to the Amir Chakhmaq Complex and the Zoroastrian Fire Temple, where both are quite beautiful for photos at evening time. I didn't go to the Dowlat Abad Garden which is under the WHS of Persian garden, as I had been to the Ancient Garden of Pasargadee and Eram Garden of Shiraz. My impression of Yazd is by the colour of mud, where all the buildings are same colous as the floor and desert. Historical Yazd can be done in one full day. Worth visiting. With this T List site up for consideration at the 2017 WHC in a few months time it seems worth having a review of it available here (especially as those who have already committed themselves to a guess on this site have voted it an “Inscribe”!). I have tried to remember why I didn’t review it immediately after our visit in May 2016. It was certainly not because it wasn’t an interesting and worthwhile place - we gave it a full day and 2 nights in our very crowded schedule and don’t regret that at all. I have just reread the entry on UNESCO and I think that it might have been part of the reason. The entire description is limited to this one sentence - “The historical structure of Yazd is a collection of public-religious architecture in a very large scope comprising of different Islamic architectural elements of different periods in a harmonious combination with climatic conditions.” Not very specific or anything to home in on! Presumably the rather unusual title “Historical structure of….” is equivalent to the more common “Historic centre (or “city” or “town”) of…..”. 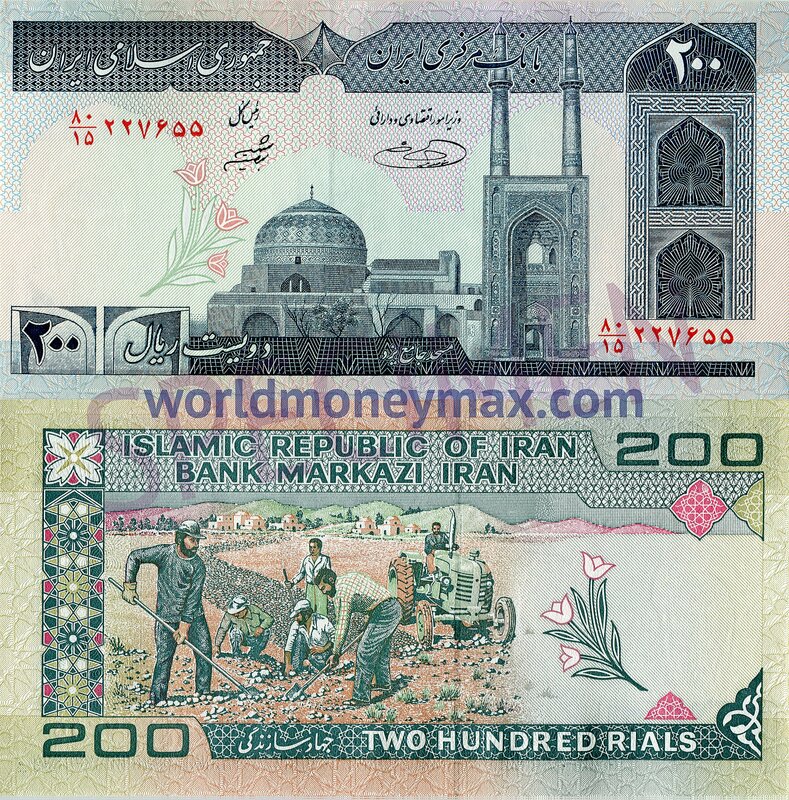 I say this because Yazd’s “Structure” is not its most notable aspect with the term implying a plan of some sort. 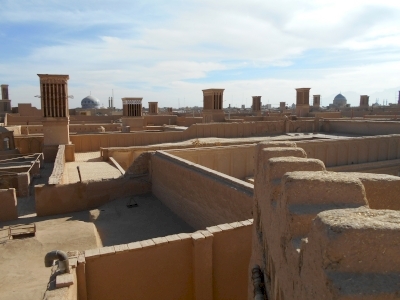 In fact Yazd is of note more for its lack of structure – LP says of it “With its winding lanes, forest of badgirs, mudbrick old town…..Yazd is one of the highlights of any trip to Iran”. 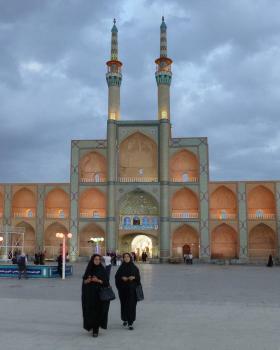 But LP also says “it doesn’t have the big ticket sights of Isfahan and Shiraz” and that is true – I have just referred to my copy of “Islam - Art and Architecture” (Pub Konemann) and Yazd only gets a mention once in the form of its Friday Mosque. Originally built in 1325 it “has one of the finest examples of the classic Iranian monumental portal surmounted by paired minarets. The fine decoration in coloured tile and the tall and slender proportions make this portal a masterpiece…….This mosque also has the best tile decoration from the Ilkhanid period in Iran”. Wiki describes it as “one of the outstanding 14C buildings of Iran”. Perhaps we are just not knowledgeable enough about Islamic architecture or we just saw too many mosques! It was “interesting” but didn’t particularly stick in our memories. b. The Zoroastrian Fire Temple – this building was only constructed in 1934 with money from the Indian Parsi community, although the “eternal flame” which can be seen behind glass is claimed to have a direct succession from Iran’s pre Islamic times. But this location too is situated well outside “historic Yazd” and, as the description on UNESCO specifically refers to “Different Islamic architectural elements”, one must presume that neither this not the previous site would be included! c.	Amir Chakhmaq Complex (photo) – It includes a mosque, several tombs and a bazaar and also a “Hosseinieh” (Maymand also has one – albeit much smaller!) A specifically Shia building for commemorations connected with the martyrdom of Imam Hossein at Karbala. Outside you will see a very large “Nakhl” or wooden palm used in the Ashura rituals. e.	The Water Museum – well worth visiting in order to learn more about the Persian Qanat – indeed one of the inscribed Qanats, the Zarch, flows beneath it! 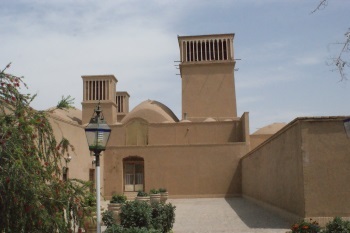 It has an additional interest in that it is housed in a restored traditional Persian mansion – there are better which can be visited in places like Kashan but this one does give you the chance to descend below the structure and see the way in which the Qanat itself was integrated into everyday life in Yazdi houses. f.	The “Badgirs” or wind towers. These are scattered around the old centre and you can go into one of them when visiting the Dalat Abad garden and see/experience how they create a draft of air. There are also various restaurants and souvenir stores around the city which attract people by offering the chance to climb to their roofs and see the “forest” of badgirs around them. Certainly worth doing. All this would seem to add up to a reasonable case for inscription – a desert city developed across the centuries to handle the climatic conditions both below and above ground and containing some significant if not “world class” buildings. It will, however, be interesting to see whether the Zoroastrian sites are included in the nomination! 4.0: Ivan Rucek Tony H.
Spice Route: Close to the Spice and Silk Roads. Silk Road: Close to the Spice and Silk Roads. Marco Polo: In 1272 it was visited by Marco Polo, who remarked on the city's fine silk-weaving industry. 65 Community Members have visited.